Without getting into versions of Apps that fit what versions of what device, let’s first just look at total counts. There are industry counts available for total number of Apps, but that doesn’t mean that the Apps are all for educational purposes. In fact, far from it. The vast bulk of Apps are really things like ring tones and games. 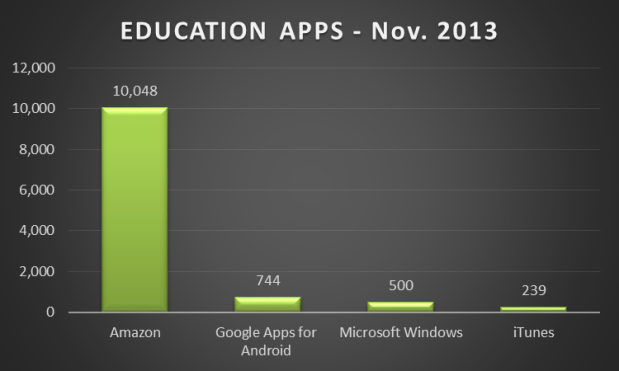 This means when you hear wild numbers like 800,000 Apps, you have to really qualifywhat it might mean for education. 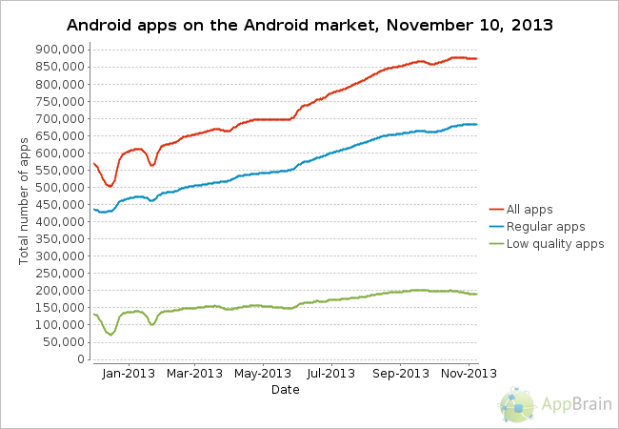 It’s important to note that that’s just the Android market, and there are millions of other Apps in the other operating platforms. Both IDC and ABI Research have also indicated that the Android platform is taking over the tablet and phone markets globally. The theories behind this have not only to do with available Apps but also utility and price. The Microsoft Surface is as yet an unknown quantity as to footprint in the Education market, and Google and Samsung have both made major inroads. The iPad clearly has the largest footprint with students, by hundreds of thousands if not millions with the recent addition of the 680,000 going into Los Angeles Unified School District. 1) Apple not only doesn’t have all the Education Apps, they have the least. 2) The Amazon Kindle Fire HDX, or any version of Kindle, is the clear App volume winner. 3) Outside of Amazon, all the platform apps are “more of the same” in terms of types of Apps. 4) With the bottom three, most of the Apps are for ages 3-9. A lot of the same developers and publishers have built apps for all of the markets, and this accounts for a sameness across the platforms. What was very interesting is that for the Kindle there are just so many more interesting apps that have high utility for schools. In fact, with the sheer volume that Amazon has, the problem of an overabundance for primary kids of the other three platforms fades into insignificance. While there are still disproportionately more for primary age, Amazon has a lot of titles for middle and high school kids, even college-age. It is important to note that the Kindle runs a custom version of Android, making for a closed system of Android. This means that those same apps won’t run other places. For some schools this will be an issue because these apps don’t have laptops to run on as alternatives to the Kindle form. For places that require regular productivity software, high-value creative lab or science lab software, this is a problem. Some schools may solve this with continuing to have computing labs for real work while tablets are pretty much consumption-only of apps, ebooks and subcription services. Across the universe of all Apps, the skews for types of Apps all look pretty much the same, with the exception, again, of Amazon. The chart shows the general profile of the types of apps available. Despite being put in the Education section, we found no real educational function unless purely from a toddler developmental view for colors and shapes, and so labeled 18% as Games. Puzzles, on the other hand, often had literacy or counting sort of inclusions in the way they were built and so are separated from Games. Astronomy apps were such a large portion of apps that they were separated out from all other learning Subjects. Learning subjects cover a big range, especially at Amazon. Much less at iTunes. DMV, or Department of Motor Vehicle Apps include taking the test and games teaching driving. Access apps are largely for gaining entrance into big Publisher’s online repositories and systems. 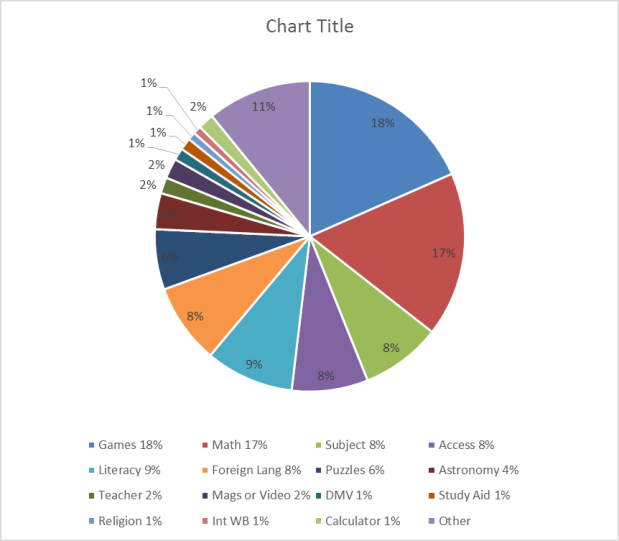 Study Aids and Interactive Whiteboard Apps are a small part of the whole. The shopping experience at the various sites could prove to be a major obstacle to creating coherent digital curriculum strategies. 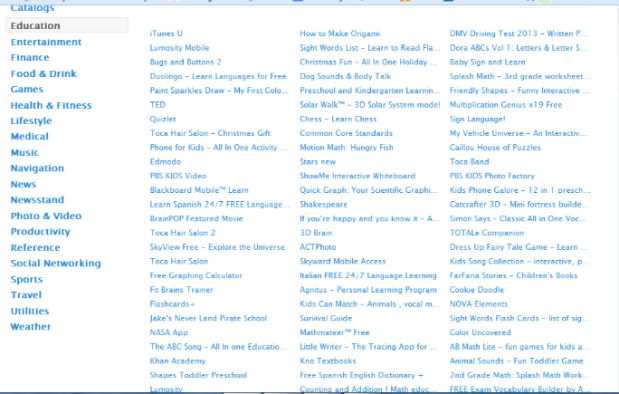 The iTunes store was a very difficult one to maneuver around in. First of all, there’s no way to shop by age, grade, or any number of other ways educators would prefer. Here is a screen shot of the entrance point, after which you must go into each individual App to determine what it is and its use. Apple also boasts their iTunes U, which has a variety of courses, though certainly not all for the K12 markets. An issue with iTunes U is that some of the courses require other, sometimes hefty, purchases. In addition, for some courses, users have to go through a process to enroll. Enrollment is a timing issue where the student has to line up with some other institution’s timing, something that is not always clear upon download of what looks to be free and ready-to-go course. In fact, many are not instant access at all but a series of steps that must be taken even after enrollment, including gathering various resources and getting a Twitter account if attendance is accounted for that way. Shopping at Google Apps for Android is an entirely better expereince. 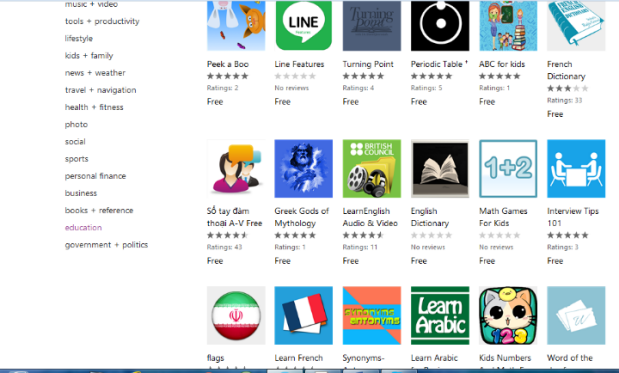 Google had the added benefit of being able to go into only Free Apps (204) or Paid Apps (540.) In addition, Google had a GED test, several grammar apps, United States History and Calculus course. Apple had none of these. Google also had reviews metrics. Shopping at Amazon was a marked deal better than either iTunes or Google. Amazon was more obviously built for ecommerce, their expertise. Their site was better at differentiating between subject areas for searching. Even so, if you take the option to shop all, you have to scroll down and sift one-by-one through 240 pages of Apps. 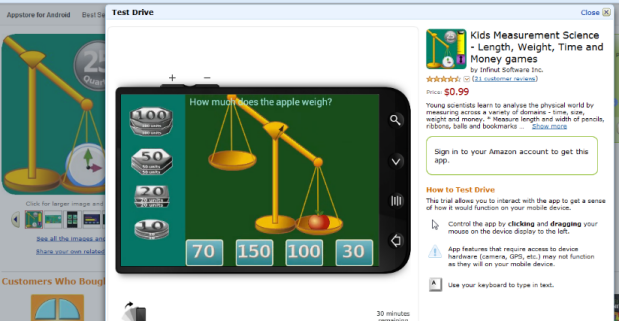 Another great thing about Amazon shopping is the ability to do an instant test drive of any App for a brief period. What’s important to remember about the Microsoft Surface or any Windows tablet is that it typically comes with a whole lot of free Apps, and all the productivity software besides. Educators have taken note of the fact that there is inherent utility in having those things all together. Windows-based computing is still the predominant platform in the laboring world. In addition, roughly 80% of the long-time publishers of the before-Apps world had built systems of full digital curriculum that run in the Windows environment. Many of those same publishers alsopublished to the Apple platform because it always enjoyed a good footprint in the education market. In the last three years many have built Apps for the iOS as well, but mostly as gateways into their larger systems. Other “born digital” publishers have everything in HTML so access from any device works.